"This is a marinated fresh vegetable salad which is very pretty in a glass bowl. It's also a great side dish." 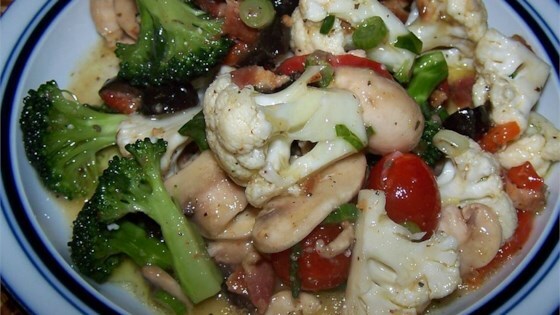 In a large bowl, combine the bacon, broccoli, cauliflower, onion, olives, mushrooms and pimento. Stir to mix. Whisk together the salad dressing, sugar, salt and pepper. Pour over salad, toss, and refrigerate until chilled. This recipe was very "blah". Edible, because it was so simple, but very boring. Also, directions say to add mushrooms, but mushrooms are not listed in the ingredient list . . .
loved it!!!! I had to leave out the olives though cause my husband doesn't like them. I made this for Easter dinner at Bette Jo's 2011. Lacie said, "Mmmm. That salad is good!" when she tried it so it must be OK. I liked it. I made it for a picnic. Everyone wanted the recipe. The only change was baby portabellos and Newman's own salad dressing.